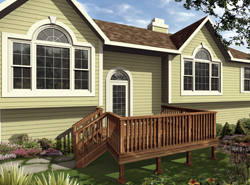 Raised deck plans are great options if you have built your new home on a sloping lot. With the slope changes, this type of deck can follow the grade of the land offering many segments. They can be built to fit any lot situation and can be constructed at any height. These decks are flexible and a great solution for any backyard. Expandable decks can be made large ror smaller to accommodate your exact backyard situation. Browse both of these versatile styles and find the perfect one for you. Our collection of raised and expandable deck plans includes many styles and sizes perfect for your building needs. We offer detailed drawings so the buyer can easily visualize the finished project. With a wide variety of plans, we are sure that you will find the perfect do-it-yourself project to fit your needs and style.